Chemical toxicity, drought, extreme temperatures, salinity, and oxidative stress, these are the abiotic stresses, and they are menace to field production and the nature of the environment. Toxic environmental conditions cause a major hazard in crops and affect the plant growth. Morphological, physiological, biochemical, and molecular changes adversely cause loss in productivity worldwide. Because of increase in stresses, the devastating global effects are observed in arable land, resulting in 30% land loss, and it may be up to 50% by the year 2050. The first approach is to increase crop production dramatically which depends on improving plant productivity under stress conditions. Halophytes could be a leading choice to meet the respective goal. Inhabiting areas for halophytic plants range from inland desert to wetland areas. 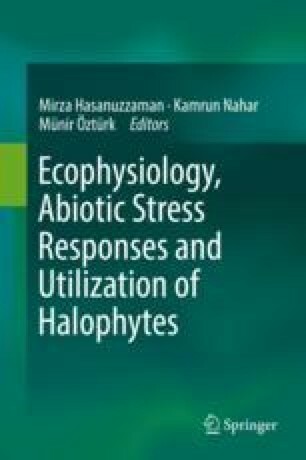 To tolerate different types of stresses, halophytes have been considered better as compared to glycophytic plants. These plants have adapted themselves with the simple mechanisms like compartmentalization and accumulation of organic solutes. Under drought stress, these plants express differential response to water deficit. During drought stress, plants evolve a number of strategies including high tolerance, storage of a large amount of water, and compartmentalization of salinity in mesophyll cells.